Their exemplary achievements are recorded in history though not celebrated enough. The stories of Bibi Nanaki, Bibi Sulakhni, Bibi Bhani, Mata Gujar Kaur, Mata Sahib Devan, Mata Sundri, Mai Bhag Kaur (Mai Bhago), Rani Sada Kaur, Rani Jind Kaur and a few others are well-known embellishments in Sikh history. Not so well known is that these and many other women have made Sikh history as well. Many of these remarkable women are unfortunately still faceless in our collective public memories, but they are certainly not nameless. Their exemplary achievements are recorded in history though not celebrated enough. Many were leaders in their own right, who stood up to aggression and resisted powerful opponents. Many times the aggressors were Sikhs themselves. Many of these spunky ladies took a stand against the odds of losing their all. The history of the Phulkian princely states has been greatly enriched by many of their female ancestors. These women were renowned for their competence as leaders and also their bravery in the face of aggression. 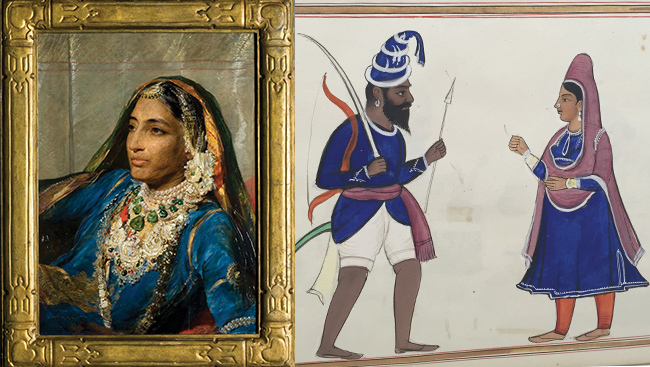 Rani Rajinder Kaur (d. 1791) has been described by historian Lepel H. Griffin in his book The Rajas of the Punjab (pub. 1873) as “one of the most remarkable women of her age. She possessed all virtues which men pretend are their own - courage, perseverance, and sagacity - without any mixture of the weakness which men attribute to women.” Rani Sahib Kaur (d. 1799) perhaps even saved the Patiala state from annihilation by her brave and foresighted stand against the Marathas. Mai Fato (approx. 1758) the wife of Baba Ala Singh of Patiala was also an able and diplomatic administrator. Rani Aus Kaur (approx.1823) ably ran the administration as regent during the infancy of her son Karam Singh. Mai Desan of the Sukerchakia Misal (approx. 1774) was a widely respected leader and administrator bravely facing the enemy in battle when the need arose. The vast territories that Ranjit Singh inherited as leader of the Sukerchakia Misal were in part due to her able leadership and fortitude. His conquest of Lahore in 1801 was also aided in major part by his mother-in-law Sada Kaur (d. 1832). While nothing is known of any daughters of Maharaja Ranjit Singh, the ladies of his family have left their mark on history. Rani Chand Kaur, Rani Jind Kaur, Sophia Duleep Singh were some of the other notable women from Ranjit Singh’s family, who admirably rose up to lead at the need of the hour. It is not uncommon for historians to be biased to the political masters of the time and malign many of these fearless and spirited women in ways that men never have to worry about. The celebration of these remarkable women will strengthen our memories. The missing piece will have to be provided by our talented artists who can bring these women visually alive in our collective memories. This is my hope and endeavour. The future for Sikh women is bright and free. It has been continuously built on the foundations laid by these trailblazers. Brave and young Sikh women all over the world are making waves. Lily Singh of Canada and Gurmehar Kaur of India have been named as the Top Ten Next Generation Leaders by Time magazine. Author Rupi Kaur of Canada topped the New York Times best-seller list with her first book. It is increasingly important for us to share these stories, both new and old, because these are stories of faith, resilience, grit, talent and vision proving that leadership is gender-free. These are also stories of women. According to the most recent numbers from Statistics Canada, the average cost of raising a child from birth to 18 years old is $253,956. At over a quarter million dollars, children aren’t cheap. Have kids identify what they love most about their current home and what they most want to see in a new home. By donating an organ, you don’t just transform the life of the recipient; you also touch the lives of their loved ones. A mother is like an alchemist in the kitchen, always on the lookout to build her child’s immunity, strength and bone health by the choices she makes every day. As we celebrate International Women’s Day, we see the great things women have accomplished in their community and in the professional world over the years. This growth and positive change should be celebrated, as it will encourage us to continue to strive for equality.